"Hi, I'm Pamela Sweetland, proprietor of 'Boveys Down Farm's own on & offsite catering service. My love of cooking has been with me since I was a child and I have always known that catering is where I wanted to be professionally. 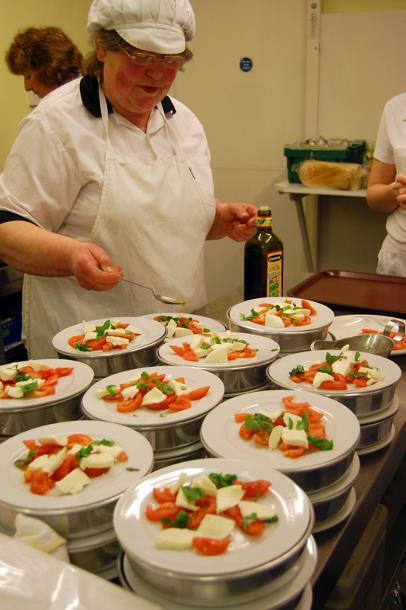 I initially started in catering in 1974 and obtained my Higher National Diploma in High Volume Catering in 1975. I started my working life with Devon County Council at which point I was the youngest Kitchen Manager in the country. In the late 1970s I catered for Sir Peter Emery at many of his numerous political conferences. Not long after that I was headhunted by the International Broadcasting Association to cook on national television. However, personal commitments at the time led me to reluctantly turn down this offer. I finally found my true calling in 1980 when I established my own catering company 'Sweetlands Country Fare'. With over 40 years' experience, and hundreds of satisfied customers you can be assured that your special day will go smoothly." Pamela, and her team, provide you, the customer, with the finest bespoke service making your event our top priority be it a wedding, dinner party, function, birthday party, funeral etc. We have extensive experience in catering for both large and small; both private and commercial functions. We can do as much or as little as you like. As well as preparing and serving the food we offer equipment, crockery, linen hire and can even assist you in site decoration and event planning.